Thanks HR!Great upgrade for cheap.Looks much better and you can actually see gauges.All good! yep years later and I'm still VERY happy with mine...no degradation to the decal overlays at all. Looks GREAT dude! 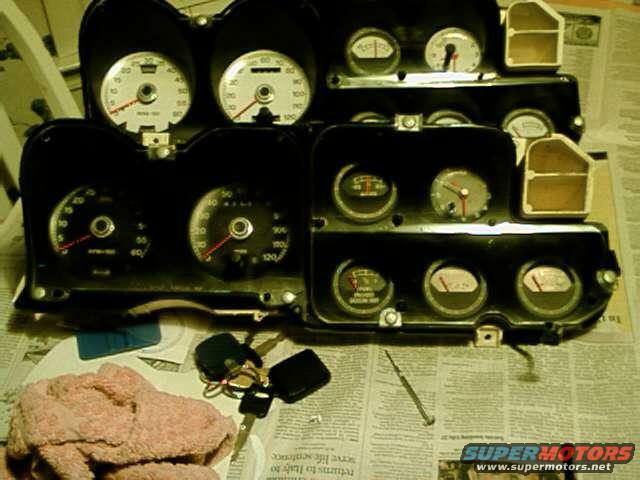 First of all...this is not for the faint of heart...please reference 72GTVA's excellent instrument panel article for differences between different cluster packages and possible modifications which may be necessary. That said... my cars original package was suffering from severe dry rot but still functioning. Anyone with these cars understands how difficult night vision on these gauges is... ...terrible is being generous. Plus I wanted something a little different. I pretty much am of the opinion that the only proper way to upgrade instruments on our 'cheros is to make a new panel with quality instruments..as several on this site have done. That being said...i'm too poor/ not technically skilled enough/ challenged on time... so this is what i did. This is the package $20...seems a good deal.. the overlays are basically a 3m decal type product... I had used one on a 81 mustang years passed and it did well.. The recommended installation package... (consisting of a squirt bottle/squeegee/razorblade for 5$ additional) is unnecessary..but i decided to get it anyway. i hope you agree the final result is very readable.... Im still waiting for the white led's to come in to replace the instrument lights...im trying to reduce the heat on the structure because i believe this worsens the dry rot of the plastic. Also I coated the white gauge housing with a film of PCV glue on the tabs for mounting...etc..in hopes of prevent this occurance in the future.. I am pleased with the result and will post a night pic as soon as the dash is back to operational. I might even decide to do another cluster as a backup. the decal package does come with decals to finish the "round" portion of the small gauges...but i liked the contrast of the black foreground/white instrument background... so you can finish as you like. FINIS! 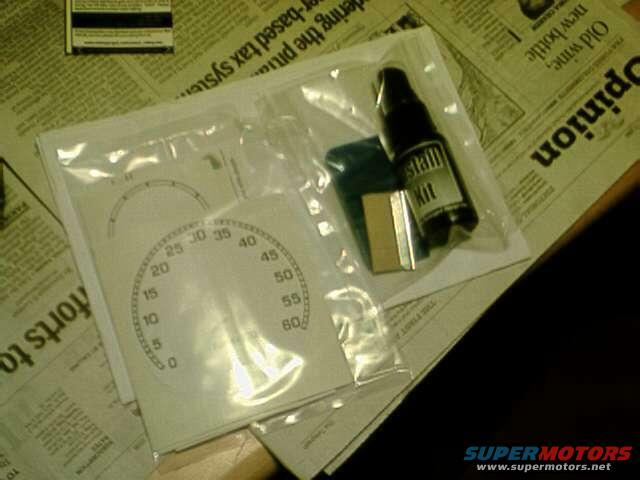 Probably - you would likely need to send the speedometer to a repair service to allow them to convert the sweep width per the speed range desired as the range is very different with the sporty 85 mile speedo. Quite a few different vendors online - you might call them. I'd imagine the process would be you apply the desired facia and then send it in to them to rework to get you in the ballpark. 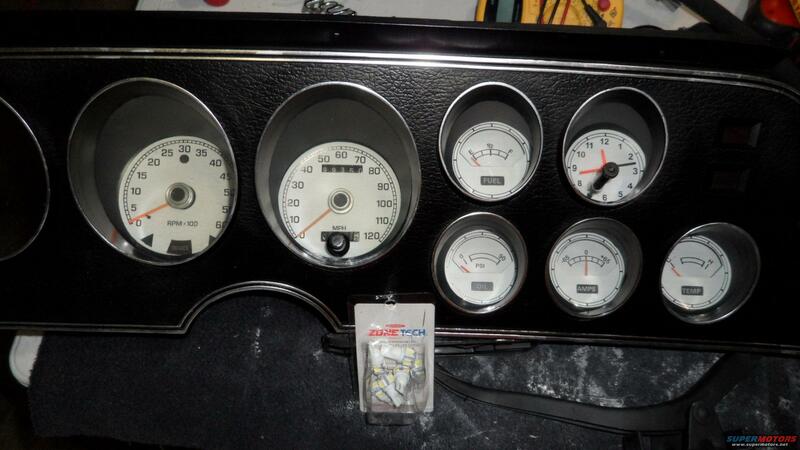 If you were to go with the full white face conversion it might be easiest to get a 1976 speedometer which will have the same layout (difference is high beam indicator is red in 1976 vs blue in '77 & up), and apply the white face decals on all the gauges to make them uniform.